DIE Jovis, videlicet, 30 die Junii. Benyon sent to Colchester Gaol. Somner sent for, as a Delinquent. Town of Colchester versus Freshfield. Ld. Loftus and Sir Phillip Manwaring. Letters from the King, to Lord Say & Seal, to attend him at York. Ld. Say & Seal to attend the Parliament. Convoy for the Magazine from Hull. The Order for 5030 l. to be paid to the Garrison at Portsmouth. The King's Letter, commanding Lord Say & Seal to attend Him. 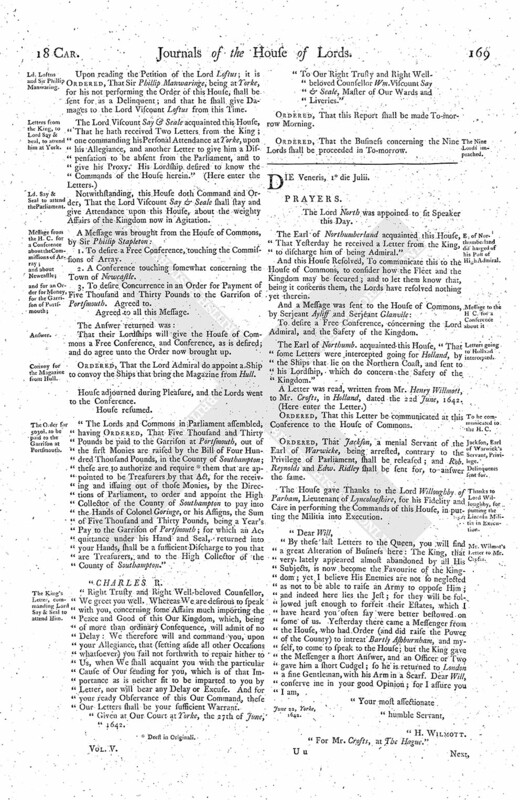 The Lord North was appointed to be Speaker this Day. Ordered, That Mr. Benyon shall be sent away presently to Colchester Gaol, according to the Judgement of this House. Ordered, upon the Petition of Jo. Lake, &c. That the Consideration thereof is referred to the Prince's Attorney, to report the Truth of their Petition, and whether the Actions at Law ought not to be prosecuted, &c.
Ordered, That Wm. Somner shall be sent for, as a Delinquent, for being an Actor in taking away Part of the Magazine in Lancashire. Or any Two of them, shall meet on Saturday next, in the Afternoon, and examine the Witnesses of the Town of Colchester and Freshfeild; and that Mr. Justice Reeves is appointed to be an Assistant to the said Lords Committees. 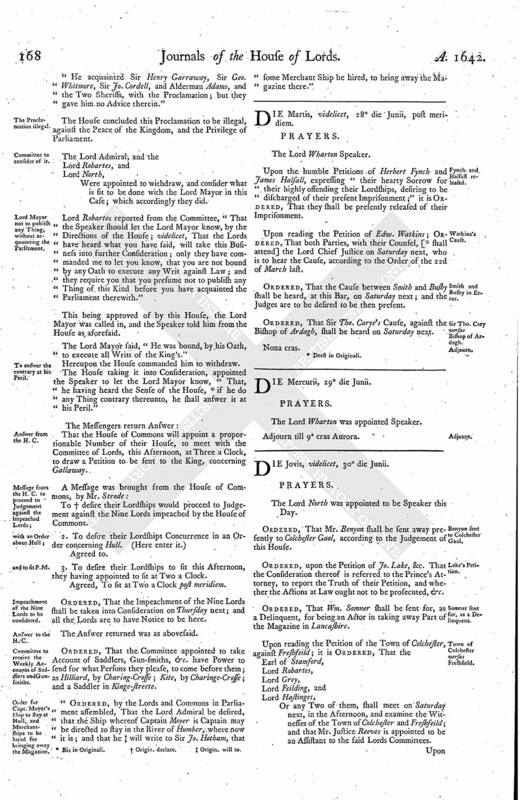 Upon reading the Petition of the Lord Loftus; it is Ordered, That Sir Phillip Manwaringe, being at Yorke, for his not performing the Order of this House, shall be sent for as a Delinquent; and that he shall give Damages to the Lord Viscount Loftus from this Time. Notwithstanding, this House doth Command and Order, That the Lord Viscount Say & Seale shall stay and give Attendance upon this House, about the weighty Affairs of the Kingdom now in Agitation. 1. To desire a Free Conference, touching the Commissions of Array. 2. A Conference touching somewhat concerning the Town of Newcastle. 3. To desire Concurrence in an Order for Payment of Five Thousand and Thirty Pounds to the Garrison of Portsmouth. Agreed to. Agreed to all this Message. That their Lordships will give the House of Commons a Free Conference, and Conference, as is desired; and do agree unto the Order now brought up. Ordered, That the Lord Admiral do appoint a Ship to convoy the Ships that bring the Magazine from Hull. "The Lords and Commons in Parliament assembled, having Ordered, That Five Thousand and Thirty Pounds be paid to the Garrison at Portsmouth, out of the first Monies are raised by the Bill of Four Hundred Thousand Pounds, in the County of Southampton; these are to authorize and require (fn. 1) them that are appointed to be Treasurers by that Act, for the receiving and issuing out of those Monies, by the Directions of Parliament, to order and appoint the High Collector of the County of Southampton to pay into the Hands of Colonel Goringe, or his Assigns, the Sum of Five Thousand and Thirty Pounds, being a Year's Pay to the Garrison of Portsmouth; for which an Acquittance under his Hand and Seal, returned into your Hands, shall be a sufficient Discharge to you that are Treasurers, and to the High Collector of the County of Southampton." "Right Trusty and Right Well-beloved Counsellor, We greet you well. Whereas We are desirous to speak with you, concerning some Affairs much importing the Peace and Good of this Our Kingdom, which, being of more than ordinary Consequence, will admit of no Delay: We therefore will and command you, upon your Allegiance, that (setting aside all other Occasions whatsoever) you fail not forthwith to repair hither to Us, when We shall acquaint you with the particular Cause of Our sending for you, which is of that Importance as is neither fit to be imparted to you by Letter, nor will bear any Delay or Excuse. And for your ready Observance of this Our Command, these Our Letters shall be your sufficient Warrant. "Given at Our Court at Yorke, the 27th of June, 1642. "To Our Right Trusty and Right Wellbeloved Counsellor Wm. Viscount Say & Seale, Master of Our Wards and Liveries." Ordered, That this Report shall be made To-morrow Morning. Ordered, That the Business concerning the Nine Lords shall be proceeded in To-morrow.